Established a risk map on the effect of sea-level rise and climate change on salt intrusion in the Mekong Delta up to the years 2030 and 2050. Analyzed land suitability for potential land-use systems under different sea-level rise and infrastructure development scenarios, and the socioeconomic characteristics of each system in various agroecological zones. Developed improved rice varieties using conventional and complex crosses to investigate underlying genetics and the value of parental lines in breeding for stress tolerance. Conducted more than 49 participatory varietal selection trials using 41 rice varieties and distributed more than 27,600 kilograms of best-bet variety seeds to farmers from 2011 to mid-2013. Identified the combination of alternate-wetting-and-drying technology, reduced phosphorus use, and transplanting as a climate change-adaptive strategy for rice production in the Delta. 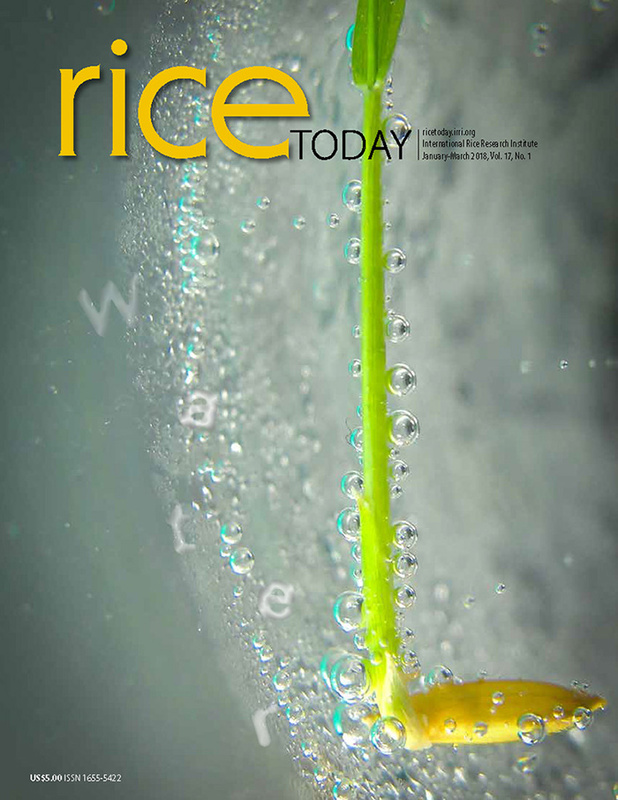 Recommended a short-duration high-yielding rice variety that can replace the local variety Mot Bui Do in the shrimp-rice system in Bac Lieu Province. Improved farmers’ income through integration of non-rice crops into rice-based systems (although poor community water management remains a barrier to upland crop production). Identified determinants and solutions for further improvement of livelihoods of rice farmers in the Delta. Developed initial data on emissions in the Delta as a function of crop management. The review was presented during a gathering of CLUES project partners and collaborators on 19 September 2013 at Can Tho University (CTU) in Vietnam. Attending were more than 80 scientists and partner representatives, including local staff, from Vietnam partners (CTU; Cuu Long Delta Rice Research Institute; Southern Institute for Water Resources Planning; Institute of Agricultural Sciences for Southern Vietnam; and the Department of Agriculture and Rural Development of An Giang, Can Tho, Hau Giang and Bac Lieu provinces); the Deutshe Gesellschaft fur Internationale Zusammenarbeit (GIZ); and the Commonwealth Scientific and Research Organization (CSIRO), the International Water Management Institute (IWMI), and IRRI. The project began work in March 2011 and will conclude in February 2014. IRRI climate expert Reiner Wassmann is the project leader of CLUES. Other IRRI scientists involved are To Phuc Tuong, Russell Reinke, Abdelbagi Ismail, Thelma Paris, Romeo Labios, and Ngo Dang Phong. CSIRO was represented by Bennett Macdonald, Peter Brown, and John Ward, while IWMI was represented by Chu Thai Hoanh. Senior scientist Takashi Yamano shared about IRRI’s collaborative research programs, implemented under the Institute’s Social Sciences Division, during the 21st annual conference of the Agricultural Economics Research Association (AERA) held at Srinagar. A decades-long collaboration just got a new home. The IRRI-Myanmar Office was inaugurated on 12 September 2013 with IRRI’s Deputy Director General for Communication and Partnerships V. Bruce J. Tolentino and Myanma Department of Agriculture Deputy Director General Aung Kyi cutting the ceremonial ribbon. Dr. Tolentino reiterated IRRI’s commitment to help Myanmar achieve its goals of becoming a major player in the global rice market and expressed hope that the country, with the help of IRRI, will use its rich resources in a sustainable and environment-friendly manner. Dr. Kyi, for his part, recalled the pride of being a former top exporter of rice, and said that Myanmar is set to reclaim that standing. He also thanked IRRI for being a steadfast partner in the past decades. Dr. Kyi and Dr. Tolentino were joined by IRRI-Myanmar Liaison Scientist Madonna Casimero, IRRI National Programs Relations Head Julian Lapitan, Donor Relations and Project Coordination Head Corinta Guerta, as well as representatives from donor organizations, employees of the Myanma Department of Agriculture, and staff members from IRRI Headquarters and the IRRI-Myanmar Office. Highlighting the strategic role and potential of the Council for Partnership in Rice Research in Asia (CORRA) in strengthening partnership among key stakeholders on rice research and development in Asia is the guiding theme of the council’s 17th annual meeting held at Kandy, Sri Lanka, on 5–6 September 2013. "Weather-on-the-Go" as Best Innovation App - notifies users of weather forecasts and changes via SMS and a web-based app module; developed by GoRated Team (Gian Santillan, Patrick Ofilada, and Ericson Luciano). "HarBestDeal" as runner-up for Best Innovation App - a platform that establishes communication and trade among farmers, traders, and IRRI; developed by HarBest Team (Tito Mari Francis Escano and Nel Vergara). A training course on the use of a prototype of the Weather-Rice-Nutrient Integrated Decision Support System or WeRise for rainfed lowland rice production was held on 19–20 August 2013 at Vientiane, Laos, and on 22–23 August 2013 at Bogor, Indonesia. Two all-in-one computer units and a laptop were donated to the Philippine CyberVillage project by Lenovo (Singapore) Pte. Ltd. The equipment was turned over to representatives of the CyberVillage project by Maria Victoria Agorilla, Lenovo country general manager and officer of the InfoCom Technology Association of the Philippines or ITAPhil. Twenty six responders completed the Neighborhood Emergency Service Team (NEST) training on light search and rescue in difficult mountain areas, medical preparedness, fire and earthquake response, anti-terrorism skills, and hazard mapping among others on August 26-30. The new members of the NEST team were resident of upland barangays of Sta. Cruz, and Bitin in Bay, Laguna.